Edinburgh Monarchs have given themselves a fighting chance of reaching the KO Cup semi-finals after going down 49-41 against Scunthorpe Scorpions in their quarter-final first-leg tie at the Eddie Wright Raceway tonight. It proved to be something of a see-saw encounter during the early heats as Monarchs earned a share of the spoils in the opening race. But then the Scorpions scored a big 5-1 in the heat two reserves’ race when Josh Bailey and Ryan Kinsley outpaced Monarchs’ tail-end duo William Lawson and Luke Ruddick. However, Monarchs ace Josh Pickering and partner Joel Andersson levelled the scores at 9-9 with a 5-1 of their own against Danny Ayres and the experienced Jason Garrity whose bike packed up. But the Scorpions hit the front once again in heat five when Garrity and Ayres took maximum points against Monarchs’ top pairing of captain Ricky Wells and Justin Sedgmen. This edged them ahead 17-13. The Scorpions increased their lead to six points in heat six with a 4-2 from Josh Auty and Stefan Neilsen against Cameron Heeps and Lawson. And Scorpions repeated the trick two races later when Nilelsen and Bailey outpaced Sedgmen and Ruddick. The Scorpions now led 28-20 and were clearly intent on building up a sizeable first-leg advantage. The ninth race was shared much to Monarchs’ relief. And it was clear Monarchs believed this cup tie should have been postponed to a later date in the season coming just two days after they officially opened their 2019 season. But this made no difference to the Scorpions who notched up their third 5-1 of the meeting in heat ten when Auty and Nielsen headed home Pickering and Andersson to pull further in front 36-24 with Monarchs toiling to keep in touch despite the fact of boasting a creditable away record against their hosts. But a lack of competitive match action for Monarchs was coming home to roost due to their late start to the season. Monarchs hit back in the 12th race with a 4-2 from Pickering and Lawson over Garrity and Bailey which reduced their deficit to ten points, 41-31. Monarchs actually gated in a 5-1 position with Lawson holding out Garrity for three laps before Garrity managed to split the Monarchs pair on the last lap. Heat 13 was shared before Lawson replaced Ruddick in heat 14, and it proved to be a masterstroke as he and race victor Andersson scorched to a 5-1 against Ayres and Kinsley to cut the arrears to just six points 45-39 with one heat to go. It was a great effort by Lawson, who defiantly kept both Scorpion riders at bay. 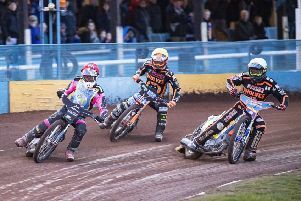 The Scorpions rescued a 4-2 from the final heat to furnish themselves with an eight-point cushion for the second leg at Armadale later in the season. Scorpions: Auty 13, Nielsen 9, Allen 8, Garrity 7, Ayres 5, Bailey 5, Kinsley 2. Monarchs: Heeps 11, Pickering 8, Wells 7, Andersson 7, Sedgmen 4, Lawson 4, Ruddick 0.